Not so long ago, it was considered a part of fine manners to use bad language, to possess an extensive repertory of oaths, and to blaspheme regularly. Now swearing is the exception. Even peppery old generals have learned to restrain their ardour and their language; much-tried masters of hounds rarely give vent to an oath; and horses, a connection with which was supposed to lead to a strange affinity with bad language, no longer tempt the racehorse owner, the trainer, or the jockey to its indulgence. A general sobriety of speech and demeanour has spread over persons in authority. No schoolmaster would dare to swear at his boys as the immortal Dr. Keate did in the old days at Eton College. A volley of oaths would leave the young recruit as unmoved as a volley of shot the old hand. In the same way ladies of quality used and listened to strong language that would nowadays shock their ladies’-maids, and cause them promptly to complain were it addressed to them by the footman. Drinking also has gone out of fashion, as far as persons being seen drunk in public; though doubtless a good deal of liquor is absorbed in nips of whiskey and soda and liqueurs during the day by young men at their clubs. Champagne is the essentially popular wine of Society; and Society, accustomed to take this delicate sparkling beverage already with the sonp, does not care to sit drinking claret after dinner. Rather do the fumes of tobacco allure at that period. The cigarette has superseded the snuff-box, and may safely be said to be the trivial vice of the nineteenth century. Some people are never without one of these cigarettes in their mouth; a cigarette smoker may consume as many as thirty during the day. He may smoke before breakfast, and after he has retired to rest; even, if he be an inveterate smoker, between the courses of dinner, but this is rare, except in Spain. But the habit of smoking in the dining-room has invaded all classes. 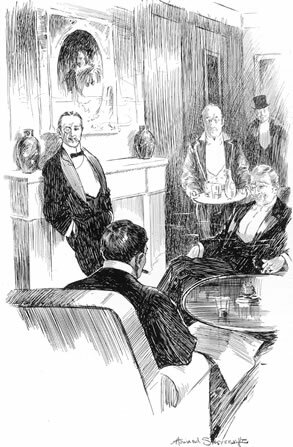 Directly the ladies have left the dining-room, the silver cigarette-box and the dainty spirit lamp wherewith to light it are passed round; and the man who does not smoke must either endure it or go. This cheery, convivial practice, essentially foreign in its origin, began in the highest circles, and has descended to the lowest; after luncheon as after dinner it is indulged in, until the consumption of cigarettes forms a considerable item in the family expenditure. Ladies encourage and imitate the habit, and, being always anxious to please, willingly learn to take a puff at the odorous weed themselves. This condescension on their part has insensibly resulted in an acquired taste that bids fair to rival the habits of men. Trade, to engage in which was formerly considered a disgrace for any gentleman or lady by birth, which was considered to place its votaries without the pale of society, is now frankly adopted; and a large crop of lady dressmakers, modistes, and flower sellers, who call themselves by all kinds of fantastic French names, and persecute their grand relations for their patronage and custom, has blossomed out into dainty shops in the most popular thoroughfares of London. Duchesses and countesses, dowagers and budding daughters, drink tea with them in their shops, and are not at all ashamed to show themselves in public in their company at Ascot, or in their boxes at the opera, for they are generally beautifully dressed, much admired and courted, while they not infrequently prove themselves excellent women of business. This mixture of aristocratic shop-keeping and Society-going seems somewhat incongruous, and it sounds curious to hear of apprentices and shop-girls, flown from the horrors of book-keeping and stocktaking, spending their holidays as guests in ducal castles and the exclusive houses of the nobility. Youths of quality sell tea, and beer, and wine, and cigars, and do all sorts and kinds of things, creditable or otherwise, to gain a living. For, indeed, younger sons who are the pride and the bewilderment of families, have a predilection for living, and usually for living well. A crust and a garret does not appeal to them, brought up as they have been from childhood in the paternal castle, or in the midland mansion, with an army of grooms and keepers and gillies at their beck and nod, and a stable full of horses to save them any superfluous expenditure of shoe-leather. Poverty, even economy, does not seem possible to them. A ride on a ‘bus or a chop at the club makes life not worth living. What is existence without a valet to get your hot tub, and lay out your dry coat and silk under-garments before the fire in readiness for the return from shooting; to pack the endless knick-knacks of a gentleman’s attire, and look after dressing-bags and sandwich cases when you travel; without a pair of guns or rifles always handy wherewith to slay something on the moors and in the forests; and a bottle of dry champagne and a shilling cigar with which to talk and meditate over the day’s doings! Yet the embarrassed landlord, be he even an earl, with heavily mortgaged estates and a string of children to educate, is pretty much in the position of the middle-class tradesman (and much less well off than the merchant or the self-made man), when he turns his sons out on the world to get their own living as they may. Two or three hundred a year is the utmost he can afford to allow them; and how can a gentleman with expensive tastes, and a lavish bringing-up, contrive to live on that? How can he spend, and enjoy, and flirt, and travel, and finally marry on such a wretched pittance? The younger son realises this, and has decided the question for himself. The army, he avers, is a delusion, bristling with stiff examinations and difficult cramming. The navy is the same, and a hard profession to boot. The church is dull, old-fashioned, and impossible. The bar, precarious, disappointing, and liable to unpleasantly weary drudgery. So the younger son has invented for himself a new profession. The pseudo Sir Roger Tichborne once said, “Some men has money, and some has brains”; and the younger son has been shrewd enough to lay this axiom to heart. With brains you can fatten at other people’s expense; with brains you can make men pay a share of your cost and your keep, and, while enjoying all the fruits of riches, yet preserve yourself unspotted from their responsibilities. So we see a man whose nominal capital is three hundred a year—scarcely sufficient to satisfy the claims of his tobacconist or his bootmaker—back an animal for seven hundred pounds in a race, or buy a thorough-bred horse for a “cool thousand,” or sport a phaeton and a pair of the very best steppers London can produce, or keep an excellent cook, and nice rooms magnificently furnished, in which he gives capital dinners to a select party of friends! How is this done? Who pays for the perfect fitting clothes, the well-brushed hats, the variety of suits, and the daintily varnished boots that come from the most expensive makers? Who settles the bills and accounts for the rent, and enables the man to show a smiling, unruffled countenance, and a brow free from care? These people seem born with a silver spoon in their mouths; they have apparently no cares and troubles like other folk; they flourish as the wicked were formerly supposed to do, like a green bay-tree. It probably wasn’t anything stronger than damn or bloody, lol. But you know the Brits know how to curse fluently and creatively! Interesting post. Full of lots of nuggets of information. Although, looking at the date on it, wasn’t this the Victorian society instead of Edwardian?